+ 1 Extra Day: Arrive 1 day earlier or stay 1 day longer. Just send us the flight details. What is “Meet us there”? This trip DOES NOT include the flights to and from Ibiza. Hence, you simply buy your flight tickets for the time and airport that suits you the best and meet us in our hotel. You can arrive in Ibiza any time on the day of arrival, your Citylife Team will be waiting for you in the hotel for the check-in. All you need to do is to book your trip and flight ticket and let us know your day and time of arrival and departure. A good website to look for flights is www.skyscanner.com. If you want to arrive earlier or stay longer, please send us an email to trips@citylifemadrid.com and we’ll arrange it for you. Ibiza is usually reserved for famous, high profile clients such as Kim Kardashian, Orlando Bloom, Justin Bieber, and Kate Moss, but now it’s your turn to be on the list. 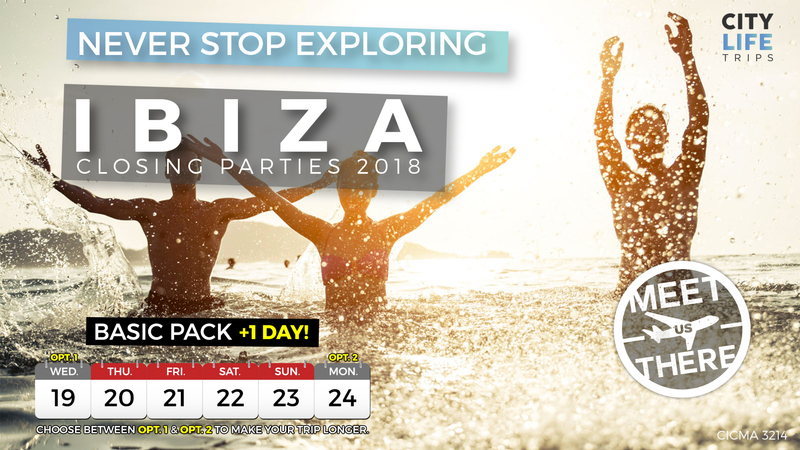 Recorded in the Guinness Book of World Records as the “entertainment island of the world,” Ibiza knows how to close out the end of the summer in style, and we will be there to go out with a bang! Private transportation, hotel with included breakfast, accompanying photographer, travel insurance and an endless list of optional activities such as party cruises, scooter rentals, beach clubs, pool parties and island hopping to nearby beaches, this trip is guaranteed to make you feel like you ended your summer properly. Check out our Ibiza video to get an idea of what this beautiful island has to offer!